In large saucepan or Dutch oven, melt butter over medium heat. Cook coleslaw mix, onion, celery and caraway seed in butter 2 to 3 minutes, stirring frequently, until vegetables are crisp-tender. Stir in remaining ingredients. Heat to boiling; reduce heat. Cover; simmer 5 to 10 minutes, stirring occasionally, until potatoes are tender and soup is thoroughly heated. You can substitute 2 1/2 cups shredded cabbage and 1/2 cup shredded carrots for the coleslaw mix. 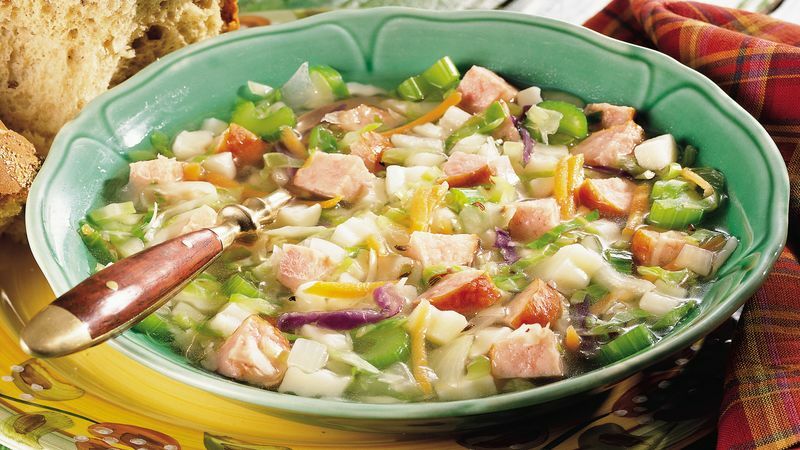 Reduce the fat and sodium in this soup by using low-fat turkey kielbasa and choosing fat-free chicken broth with 1/3 less sodium.